Sassiest Boys In America: Where are they now? Sassy was edited by Jane Pratt (who went on to form the less edgy Jane). 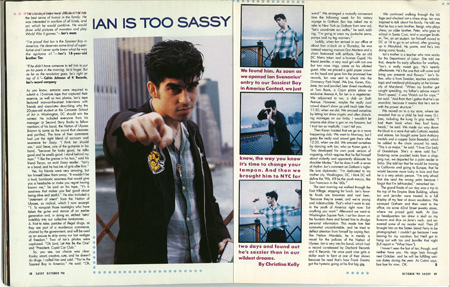 It delighted hipster teens from 1988-1996 because it was chock full of independent spirit: great writing championing indie bands (with its “Cute Band Alert,” which wasn’t always boy bands), interviews with youth culture’s movers and shakers, awesome features and feminist commentary on a yucky mainstream. The magazine discovered fashionista Chloe Sevigny and made her one of its interns, which Sevigny parlayed into a stint as an It Girl and later a successful acting career. Sassy was also famously spoofed by Phil Hartman in a recurring Saturday Night Live sketch. Each winter, the magazine selected the Sassiest Boy In America. I thought it might be fun to remember some of the winners and find out what they’ve been doing recently. The only probem is I’m searching all over the place and having the darnedest time finding out the identities of those super sassy boys. 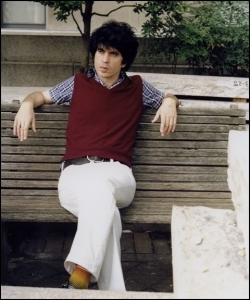 One thing’s for certain: the first and most famous Sassiest Boy In America in 1991 was Ian Svenonius, leader of Washignton D.C. band Nation of Ulysses. Help! Who were the other Sassiest Boys In America? just stumbled across your blog & have an answer to this question: i do believe they only did the sassiest boy in america once, with ian, who lied about his age in order to win the contest. 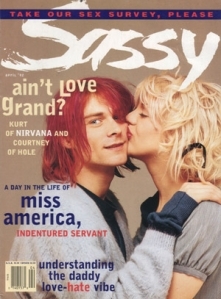 they did the sassiest girl in america contest every winter, & the winner would grace the february cover, i believe. they were always just regular high school girls who read the magazines. i remember in 1992, i think, a girl named sierra won (i remember beause it’s a different spelling of my name) & she was one of the first non-celebrity black women on th cover of a teen magazine…maybe the first? it was a big deal. apparently “sassy” was pressured to not give her the cover because the publisher thought having a black woman on the cover would hurt sales. but that is the cover i remember more than any other, for whatever reason. i think i just thought that girl was especially sassy & awesome, based on the interview inside. there was a second sassiest boy in america- his name was mike clark and he used to be in this band called the surf maggots. i remember seeing them play in portland, where i think he still lives. Hello. I also stumbled on your blog, while googling “Sassy”. I was a faithful reader, and as I recall there were 2 other sassiest boy after Ian. There was one the following year, a long-haired boy, though I don’t recall his name. By the next year seemed like even Sassy was not too impressed with the result, because I remember the title being “the sassiest boy we could find?”. And after that there was no more sassiest boy at all. I guess Ian left a pretty big shoe to fill. Thanks for the post. I enjoyed a pleasant little nostalgia trip. Sassy was something else and I missed it. The artist Cameron Jamie was at CalArts at the same time as me & he told me that he was one of the Sassiest boys in America. Don’t know if it’s true. I’m 3 years late on this post, but we’re actually doing a documentary on the Sassiest Boy in America contest from 1990. There was a winner the 2nd year, Michael Clark, but Svononius was the first winner and it was actually highly-controversial. Not just becuase he wasn’t aboy, but also because there was another contestant who actually was in high-school in New Jersey who a majority of the editors wanted to win but – so rumor has it – Pratt overruled them and picked Svonionius. We’ve been trying to interview Svononious about this but he has thus far refused our requests. If you’d like more info or have some info to share, please email me at davidwalters42@hotmail.com. Mike Clark went on to play guitar and keyboards for Stephen Malkmus’ post-Pavement band, the Jicks. There must be critical overloads of sass in that tour van.